We’ve got exciting projects in the works for 2018! 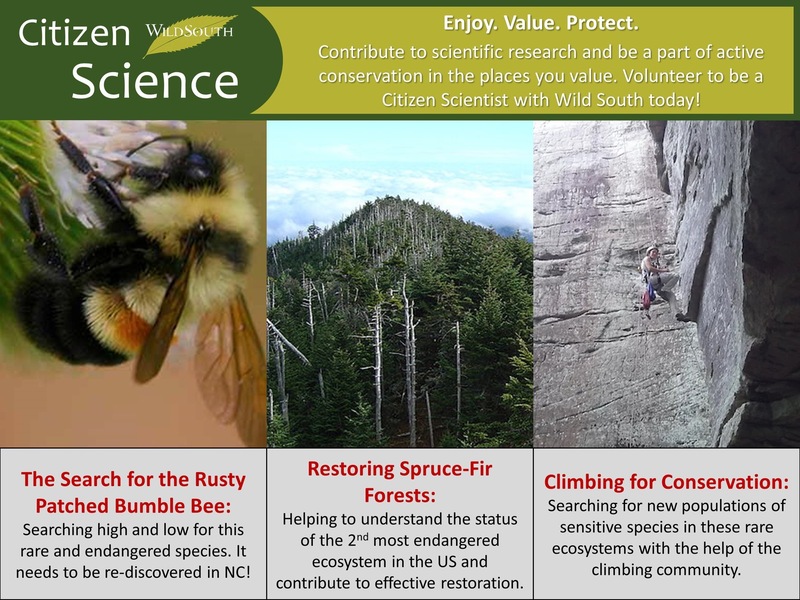 There are 3 new citizen science projects in the works to help protect Rusty Patched Bumble Bees, Spruce-Fir Forests, and Cliffside Ecosystems and WE NEED YOU! Citizen science relies on the public to contribute to scientific research. By volunteering with Wild South as a citizen scientist you would be an active part of conservation in the Southern Appalachian Mountains and really making a difference. Our projects this year will take you in search of the rarist of Bumble Bees that rely on all manner of flowers from the Springtime ephemerals to the Summertime meadows. You could also have a chance to bushwhack your way onto the highest peaks to collect data in Spruce-Fir forests or find yourself climbing cliffs and boulders in the name of science! Contact morgan@173.236.11.114 for more information if you’re interested!